Navigator Holdings (NVGS, $19.13) is in the liquefied petroleum gas (LPG) shipping industry. The liquids they ship are by-products of oil and gas production and refining. Their stock appears fairly valued based on the current industry dynamics, but the LPG shipping industry is expanding rapidly over the next few years. I believe the market is underestimating how much cash Navigator will generate in 2017 forward which creates a significant opportunity for investors willing to hold NVGS that long. Navigator operates a fleet of 28 liquefied gas carriers (plus 10 more ships to be delivered through 2017). A liquefied gas carrier is a generic term for a vessel that carries LPGs (such as propane and butane), petrochemical gases (such as ethylene, propylene and butadiene) and ammonia. Collectively I’ll refer to these liquefied gases as natural gas liquids (NGLs). Navigator currently only owns medium-sized (i.e. handysize) vessels, though they are getting into larger ships in the future. Handysize vessels are great because they can handle both medium and long distance routes and are able to access all ports unlike very large gas carriers (VLGCs). Both the liquefied gas carrier industry as a whole and the handysize niche within it are very fragmented. Navigator’s 26% market share in the handysize market is far ahead of their second largest competitor, Ultragas, with 10% of the market. The most important products to Navigator are propane, butane and ethane/ethylene. The main use of propane is heating homes which is very seasonal. Butane is used as a gasoline blendstock and as a feedstock to make butadiene (which eventually makes synthetic rubber). Ethane gets processed into ethylene which is used for industrial chemicals and plastic products. Because these NGLs are a by-product of oil and gas production and refining (mostly natural gas production), their cost of production approaches zero. This means NGL production is almost entirely based on natural gas production and not on their own supply/demand dynamics. These natural gas producers are unwilling to moderate NGL supply because it would mean moderating natural gas supply along with it. The recent shale boom in the United States has thus flooded the domestic market with NGLs causing their prices to plummet. Even though NGLs are a by-product of natural gas production, they have their own distinct supply chain and infrastructure. The difference between what an NGL can fetch on the market and what natural gas can fetch creates a price spread. If that price spread is large enough, NGLs get separated out from natural gas via a gas processor and sold separately as liquids. If the spread is low or non-existent, NGLs are left in the pipeline and sold at gas prices (this is referred to as rejection). The most extreme example of this is the current price of ethane which has been pushed below natural gas because of its supply glut. This has resulted in roughly 500,000 barrels per day of ethane basically being wasted. As mentioned above, ethane is extremely valuable to the plastics industry so ethane rejection is not a desirable outcome. Currently about 70% of domestic ethylene is produced from ethane. 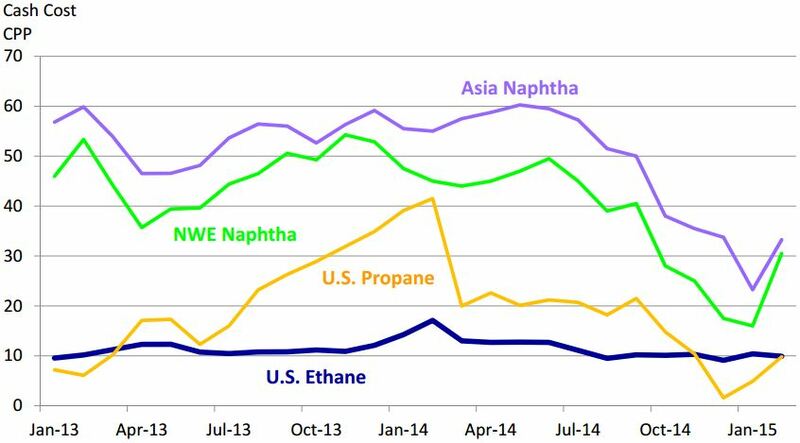 European and Asian ethylene is produced mostly from naphtha (because they lack natural gas) which is significantly more expensive than US ethane. This would be great if the US could export its low priced ethane to Europe and Asia and take advantage of the price spread between ethylene feedstocks (our ethane vs their naphtha). Unfortunately, there is not enough NGL terminal capacity to export enough ethane to fully take advantage of this price spread. Ethane rejection will continue until either higher-value domestic demand or (more likely) more international markets open up via increased terminal capacity. 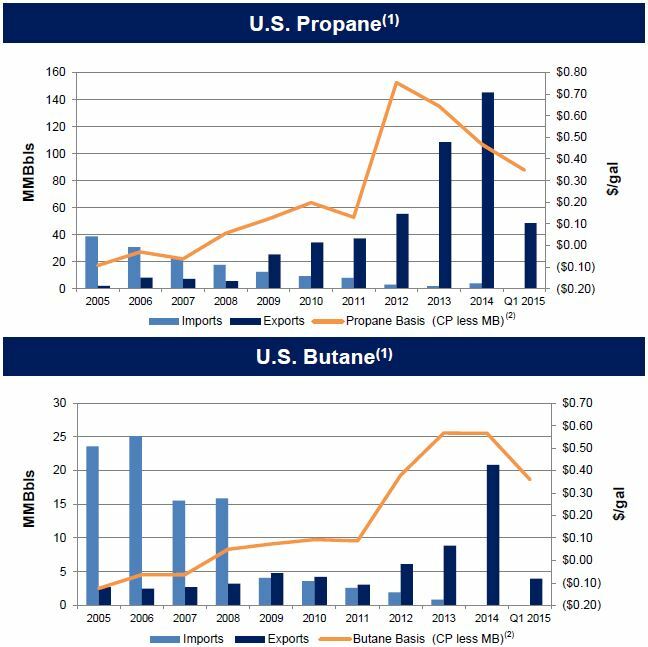 Similar price spreads exist in US propane and butane which are roughly $0.50/gallon cheaper than Saudi prices. The orange lines below are the respective spreads between Saudi and Texas prices. While I don’t think Navigator has any hard competitive advantages that create a large moat around their business, they do have several soft advantages that combine to give them a leg up on competition. Their fleet is both larger and newer than their competitors in the handysize market. Navigator’s average ship is 6.8 years old vs their competitors’ at 14-15 years. This difference will remain the same for at least the next several years as newbuilds cancel out the current aging fleet. As mentioned above, Navigator has the largest handysize fleet and they keep those ships spread out all around the world. This allows them to always take advantage of major price spreads and if a customer needs an LPG ship they will have one nearby. The great thing about handysize vessels is their ability to do medium to long haul voyages that may be uneconomical for smaller vessels, but they can also enter ports with limited infrastructure that larger vessels are not able to. In addition, 34 of their soon-to-be 38 ships are semi-refrigerated (and 14 of these are ethane/ethylene-capable). These semi-refrigerated ships can carry up to twelve different cargoes compared to fully-refrigerated VLGCs that can only carry 3-4. The more cargoes a ship can carry the higher chance they can get a load at any one time. If a customer needs ethane or ethylene, Navigator can handle it. If butane’s price spread is narrowing they can make a decision to focus more on ammonia. This flexibility increases utilization and stabilizes charter rates (and them having the largest fleet just adds to all this). Navigator’s stable charter rates are apparent when looking at their VLGC competitors. Just in 2014, Avance Gas saw TCE (time charter equivalent) rates of $34,499 in Q1 and $83,893 in Q3. Dorian LPG saw TCE rates of $39,243 in Q2 and $57,077 in Q4. Spot dayrates in the VLGC market are even more high variance—those have peaked at over $150k and dropped as low as $15k. Compare this to Navigator whose TCE rates in 2014 were the lowest in Q1 at $28,648 and peaked in Q4 at $30,723. Within an industry that is known to be cyclical, the key operating metrics for NVGS (charter rate and utilization) are incredibly consistent. Navigator entered bankruptcy in 2003 and emerged in 2006. During this time, David Butters worked on their debt restructuring at Lehman Brothers and then took over as CEO in 2008. Interestingly, Butters is Chairman of GulfMark Offshore (GLF) and a director of Weatherford International (WFT). GulfMark operates offshore supply vessels and is a direct competitor to Hornbeck Offshore Services (HOS), a company I own and have written up numerous times. Butters owns 1.96M shares of NVGS stock worth $41M. This includes 500,000 shares he purchased in early 2013 at $10/share. He has not sold one share since NVGS went public in late 2013. Niall Nolan is the CFO and owns 118k shares worth $2.5M. All directors and officers own at least some shares, with the smallest holding worth $41k and most others in the $50-150k range. Since Navigator is based in the Marshall Islands they’re not required to disclose individual executive compensation, but they give aggregate numbers. Total cash compensation to all five executives in 2014 was $3.1M with an additional $1.4M paid in restricted shares and options (all stock awards vest 100% on the third anniversary of the grant date). This puts total compensation for the executives at $4.5M (or 3.9% of operating income). While we don’t know Butters’ or Nolan’s individual pay, it’s safe to say their stock ownership significantly dwarfs their annual compensation. NVGS hasn’t been public long but I haven’t seen any management red flags yet. Also, Wilbur Ross is the largest shareholder at 39.5% of common stock and he has two board seats. Mr. Ross is an extremely successful investor who will not allow shareholders to get taken advantage of. 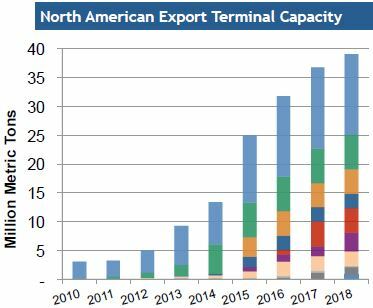 The number one tailwind to the liquefied gas carrier market is increasing export terminal capacity in the US and around the world. To take advantage of the many global NGL price spreads, more infrastructure and export capacity has to be built to encourage exporting NGLs instead of rejecting them in the gas stream. Today there are three active terminals in the US that export liquids and each one is undergoing expansion, in addition to new terminals being built. Current US ethane demand (basically ethane cracker capacity) is ~1,075 mbpd (million barrels per day) which will increase to almost 1,700 mbpd by 2018. Much of this ethylene will be getting shipped overseas. One example is Sasol which is building an $8.5 billion dollar ethane cracker in Louisiana. All of these new ethane crackers are designed to consume predominantly ethane, as opposed to heavier feedstock like naphtha, for the production of ethylene. Enterprise Products Partners LP (EPD) is working on the ATEX and Aegis ethane pipelines to support ethane crackers and petrochemical plants in the Gulf Coast. They are also building a propane dehydrogenation (PDH) plant and constructing a large scale ethane export facility at Morgan’s Point. A PDH plant takes propane and turns it into propylene—another important feedstock for plastic products. The PDH will have 1.65 billion pounds of capacity commencing operations in late 2016 and they already have a 15-year contract for 100% of capacity. Sunoco (SUN) is spending $2.5B to transition Marcus Hook in the northeast into an NGL manufacturing hub to handle the Marcellus and Utica shale regions. Marcellus is the largest natural gas field in America. When the Mariner East 2 pipeline is complete in late 2016, Marcus Hook will be able to process 345,000 bpd (exporting >200,000 bpd of this) and will ship to an ethane cracker in Stenungsund, Sweden. This Swedish ethane cracker will do 10M barrels/yr of ethylene and propylene production (equivalent to over 27,000 bpd). To get an idea of how much these export terminals can affect the gas carrier market, consider that Navigator’s ships carry 150,000 barrels which is less than one day’s worth of Marcus Hook’s export capacity. Marcus Hook by itself could require 35 handysize ships to support its exports. I’ve looked at many sources discussing planned US export capacity and they’re all in the ballpark of what the below chart shows—that export capacity should roughly double from now to yearend 2017. In addition to added export capacity, petrochemical demand will continue to grow as emerging markets develop. As countries industrialize there is a large demand increase for appliances, electronics and plastic and rubber products—all of which need petrochemicals to produce. The major demand drivers are Asia (especially China and India), Russia and South Africa. China currently has four PDH plants with total propane requirements of 2,590 kta (kilotons per annum) and is building five more that will require 3,876 kta. Just with these PDH plants, China is increasing their propane demand more than 150% over the next several years. Central and South America demand has also been on the rise with their LPG imports rising by 75% from 2009 to 2013. This is important because Central and South America are close enough to the US that these trade routes should be dominated by handysize vessels, not VLGCs. 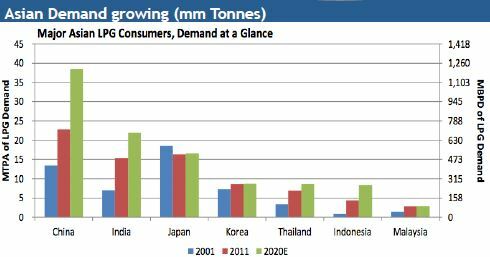 The chart below shows Asian LPG demand growth since 2001 and what’s expected in the next five years. Navigator management has hinted several times that they may in the future create a public limited partnership subsidiary. This subsidiary could house large vessels (financed with a lot of debt) that operate on long-term contracts. This is a way to separate the capital- and debt-intensive parts of the business from the shorter-term/spot market stuff. So vessels with 10+ year contracts (and their corresponding debt) would go into a subsidiary and the vessels that operate mostly on the spot market would stay under NVGS. The subsidiary then pays a portion of their income to NVGS through quarterly cash distributions. It’s a good (and very popular) way to structure these companies and would most likely result in a stock premium compared to now. Finally, as time goes on, more people will realize that LPG shipping does not correlate with crude oil prices. Right now, all LPG shipping stocks have been crushed over the past year even though business is fine. Navigator’s first quarter 2015 utilization was 97.0% and their TCE rate actually increased year over year. As LPG shipping continues to prosper during this oil downturn, LPG stocks should no longer trade in step with crude prices and other oil-related stocks. Gas carrier operators aren’t stupid—with NGL exports increasing dramatically in the near future these companies have rapidly increased their order book for new vessels. There are currently 1,314 LPG ships in the world with 233 on order (for an increase of 17.7%). Just looking at handysize, there are 92 vessels with 37 on order (11 of which are Navigator’s) for an increase of 40.2%. Compare these numbers to 2007 when the order books for total fleet and handysize were both over 30% of existing supply. Navigator’s utilization and TCE rates never suffered a dramatic decrease due to that influx of newbuilds. Even with the handysize market increasing over 40%, the pro forma fleets will be Navigator at 34 (four of their newbuilds are larger vessels) and the next closest (Ultragas) at 13. Navigator’s dominant market share and competitive advantages related to having the most worldwide and flexible fleet will remain. Management said there hasn’t been any new orders for LPG vessels in the past 4-5 months so the order book may have stabilized for now. Even if a company orders a ship today, they won’t see it delivered until yearend 2017. In addition, there are currently 11 very large ethane-capable carriers (VLECs) and 15 handysize ethane-capable newbuilds on order (four of which are Navigator’s). Offsetting these newbuilds are old ships that will be scrapped. As of September 2013, 16.2% of the entire liquefied gas carrier fleet (and 10.2% of handysize) are over 25 years old. These ships will soon be scrapped and not one of these 25+ year old ships is owned by Navigator. Comparing the industry-wide newbuilds with increasing export capacity, it is my opinion that the new vessel supply will be more than offset by new terminals coming online and old ships getting scrapped. Next, ethane prices have recently been lower than natural gas prices because a lack of infrastructure to move US ethane to market. This uncertainty will continue in the short to medium-term. In November 2014 the Singapore naphtha price was $0.65/lb vs Mont Belvieu, Texas ethane at $0.09/lb. This is a wide price gap (that is historically even wider) that can’t be fully taken advantage of because we have too much ethane and not enough infrastructure. This domestic glut has pushed our ethane prices down below natural gas which causes ethane rejection. If there’s not enough infrastructure to export the ethane to higher priced regions of the world and domestic ethane is selling for less than natural gas, there’s no reason to process more than the minimal amount of ethane that we need. As ethane pipelines are built, ethane crackers come online and export capacity increases, ethane prices will stabilize and rejection will decrease. Another concern is a prolonged downturn that reduces natural gas production and thus reduces NGL supply. This is a real concern but a couple points help our cause. First, the majority of NGLs are a by-product of natural gas as opposed to shale oil and oil refining. Shale gas has much better industry dynamics than shale oil and the highest cost fields (Permian, Bakken, Niobrara) have minimal LPG production. The majority of natural gas comes from Marcellus, Eagle Ford, Barnett, Fayetteville and Haynesville. Also, remember how much NGL is being rejected right now. Ethane crackers are running at full capacity even with 500,000 barrels per day getting rejected. Natural gas production can significantly decrease before it has any effect on NGL production. If natural gas production did decrease that much in the US, there is a significant boom in liquefied natural gas (LNG) that is about to happen in Australia. Even though much of the emphasis in this write-up has been America since NVGS is listed here, it’s important to remember this is a global company and the US is just one spoke in the wheel. Australia may very soon have more LPGs to export than even America so there is a lot of flexibility to the worldwide LPG shipping business. Navigator carries a lot of debt and they haven’t even funded six of their 2016 and 2017 newbuilds yet. The rest of the newbuilds are already funded with debt and management is confident they’ll arrange financing for the last six here soon. One of the 2016 ships already has a 10-year contract attached to it and they’re working on the others. Raising debt to fund newbuilds that already have long-term contracts shouldn’t be an issue. Also, remember the CEO, David Butters, worked on the debt restructuring at Lehman before coming over to run Navigator as they exited bankruptcy. This gives me confidence he knows his way around the debt markets and it doesn’t seem they’ve had any issues yet. Even though there are a lot of moving parts in this company and industry, valuation is fairly simple. The majority of their expenses are fixed or stable and one of the largest expenses (voyage expenses) is a pass-through that gets added to operating revenue. Therefore, valuation is almost entirely based on utilization and charter rate assumptions. 2017 is when their full pro forma fleet will be operational so that is the year I’ve chosen to value the company. The majority of the expected export terminals will also be up and running by yearend 2017. Utilization is very conservative. Their lowest utilization in the past ten years was 92.9% with an average of 97.2%. So the bear case is over 5% under the 10-year low and the base case is the lowest they’ve seen. Charter rates were inflation-adjusted forward to 2017 (assuming 2%/yr inflation in 2015-17). With these numbers, the lowest charter rate they’ve had is $26,914 with an average of $31,324. So the bear case is ~10% below the lowest charter rate and the base case is the average. Daily opex was inflation-adjusted forward to 2017 as well and the average was used across the board. Interest expense is a guess because they need new financing, but I increased it roughly 60% from current levels which should be more than enough. Also, because they’re based in the Marshall Islands they pay very little taxes. 2017 happens to be a year with very low drydocking expense. Looking at it more on a pro forma run-rate basis (bottom section of the chart), the average yearly drydocking expense from 2017-2026 is $11.63M. Drydocking is when a ship is taken out of service for 20-30 days for routine checks and maintenance. There is $20.4M worth of final newbuild payments due in 2017. I didn’t include this expense as it is growth capex and it definitely doesn’t have a place in the run-rate analysis. Adding the $20.4M expense back in decreases the bottom line numbers by somewhere between $3.00 and $5.00/share. Right now NVGS sells for 7.9x trailing twelve month free cash flow (also doesn’t include newbuild expense). Relating back to my last paragraph in the tailwinds and catalysts section, I believe LPG shipping stocks will see their multiples expand as it becomes clear they are not nearly as impacted by low crude oil prices as others in the industry. Navigator’s utilization and charter rates have been exceptionally high and consistent. Just look at my last post on Hornbeck Offshore and how supply vessel utilization and charter rates have been decreasing as of late. Navigator deserves to sell at a higher multiple than most other oil-related companies so I think a FCF multiple of 12 (or higher) is very realistic. Overall, due to their expanding fleet and the industry’s increased export terminal capacity, Navigator has very little downside looking three years out and there is potential for the stock to at least double. Obviously it makes no sense for this stock to trade in sympathy with oil. Any guesses what the actual mechanic is that makes that happen? Who’s selling? There was a hedge fund (one I’ve never heard of) selling 2-3 months ago, but besides that your guess is as good as mine. I keep thinking Mr. Market will wake up to Navigator’s consistent good performance in the face of low oil prices, but I continue to be proven wrong. Great article. Now NVGS is all the way down to $7.30. Any thoughts on the current situation? A significant part of my original thesis was that NVGS should be more resilient to the oil collapse vs more traditional O&G companies. While that remains true, their business has been impaired more than I expected. This has caused me to revisit my thesis and I am considering selling, but as of today I still own it. On the most recent conference call, David mentions three things that could happen to cause a rebound in their business and none of them gave me much confidence. Seems like they benefit from spread in gas prices. And if prices, especially naphtha, are low everywhere, there is fewer demand for traders to arbitrage? At some point that must recover. I did quite a bit of work on this when I looked into LNG, and it seems this is not sustainable (low oil and gas prices). The main cause here is the warm winter (so this seems temporary and not some fundamental in the energy market that has changed worldwide). Reading some current weather reports, and it seems there is a 80% probability of a normal to colder winter. Although currently rates are cratering. 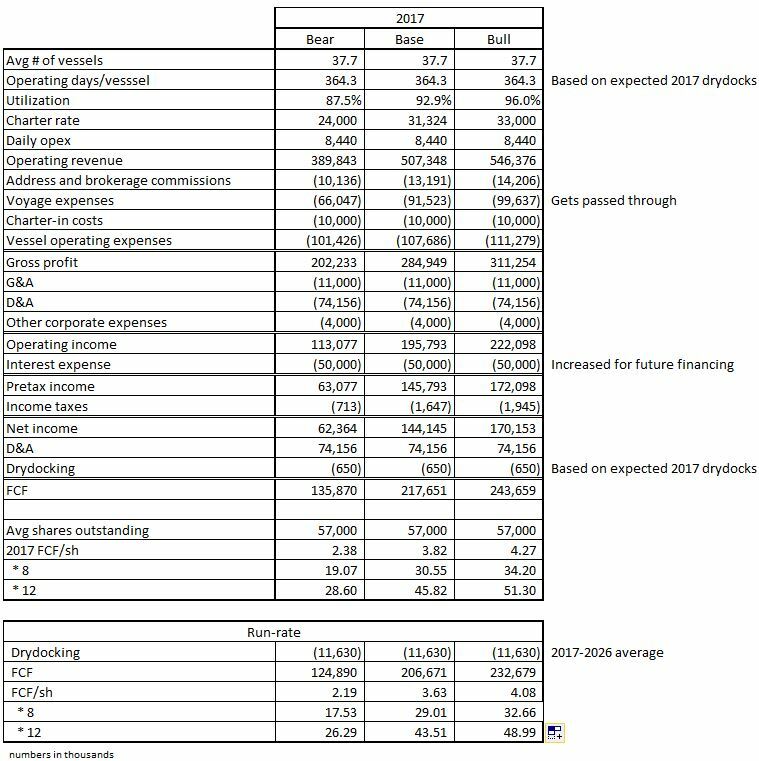 Seems like they booked almost 500m in ebitda already in time charters at good rates. This will take care of a sizable % of debt. And the discount on book value is quite large now. Once that secure charter revenue takes care of the debt in the next few years, the market will probably rerate this somewhat at least. What I am wondering, how secure are those charter contracts? Not sure if I should pull the trigger on this one. The thing with these shipping stocks is, that a lot of little things can have a big effect. Something stupid like a few warm winters in a row can make this a bad investment even at these prices. They’ve already been renegotiating some customer contracts so I wouldn’t count them as super secure. Outside of NVGS, I’ve seen plenty of shipping contracts get cancelled without much of a penalty.